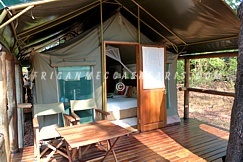 Located in the Eastern heart of the Moremi, Xakanaxa Moremi Tongue is part of the public Moremi Game Reserve, and comprises of few permanent accommodations and public camps sites for mobile safaris. It is the only part of the Okavango Delta and Moremi Game Reserve that is open to public camps sites for mobile safaris and does not have a private concession area. 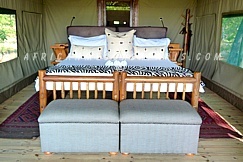 The main three accommodations are located on the banks of the pristine Khwai River that overlooks the Xakanaxa Lagoon. The Moremi Game Reserve regulations do not currently permit any of the following activities: Off-road driving, night drives, walking safaris, fishing. 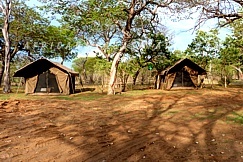 Mokoro safaris are also limited too. The ancient riverine forests, open savannah, serpentine channels as well as seasonal floodplains make up a varied habitat of exceptional fauna and flora. The diverse ecosystem ensures prolific sightings of elephant, buffalo, wild dog, hyena, giraffe, hippo, sable antelope, wildebeest, kudu, lechwe, sitatunga, lion, leopard and cheetah, amongst others. Birding is spectacular, especially in the spring and summer months when the migrants are breeding. 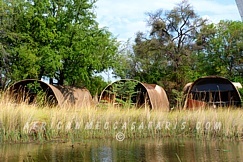 Camp Moremi in the Xakanaxa area of Moremi Game Reserve is a truly hidden gem. At the point where the life-giving waters of the Okavango Delta meet the vast plains of the Kalahari Desert, Mother Nature has created a sanctuary of Mopane forests, open grasslands, seasonal floodplains and riverine habitats, resulting in one of the most magnificent and welcoming animal environments in all of Africa. Okuti Camp caters for a maximum of 18 guests in large, beautifully-appointed rooms each featuring an en-suite bathroom with inside and outside showers, hot and cold running water and flush toilets. Five rooms are twin-bedded and two are family rooms consisting of two bedrooms with a shared bathroom. Xakanaxa Camp offers accommodation for 24 guests is in twelve spacious and tastefully furnished tents with twin or double beds and en-suite showers, hand basins and toilet facilities. Situated on the fringes of the lagoon, each tented suite has a private viewing deck with comfortable loungers.